There are so many things about losing a beloved dog that makes the process so incredibly difficult. Knowing that the time is coming and being unable to stop it can leave you feeling totally helpless. The extreme pressure of making such a big decision for your pet. And most of all, knowing you’ll never get to see their face again. It all adds up into one of the most heartbreaking events in a dog lover’s life. 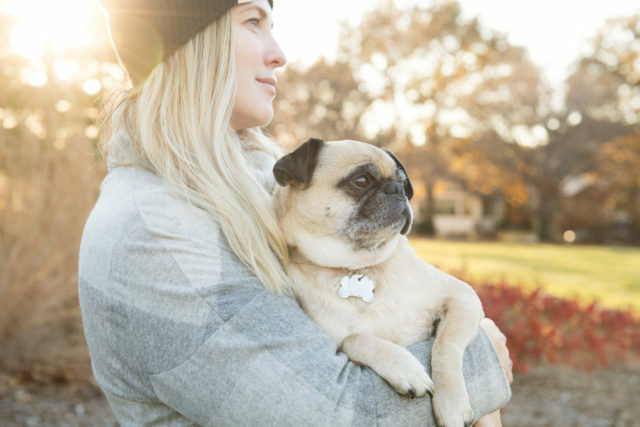 Sarah Beth Ernhart understands what it means to love a pet. 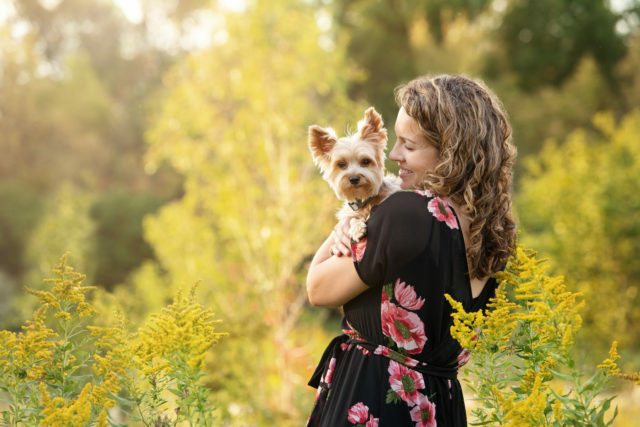 She’s lived her whole life with furry family members around, and as a pet photographer she has seen and captured the love and friendship between human and animal several times over. As a special service she offers “Joy Sessions,” photoshoots for dogs nearing the end of their lives. 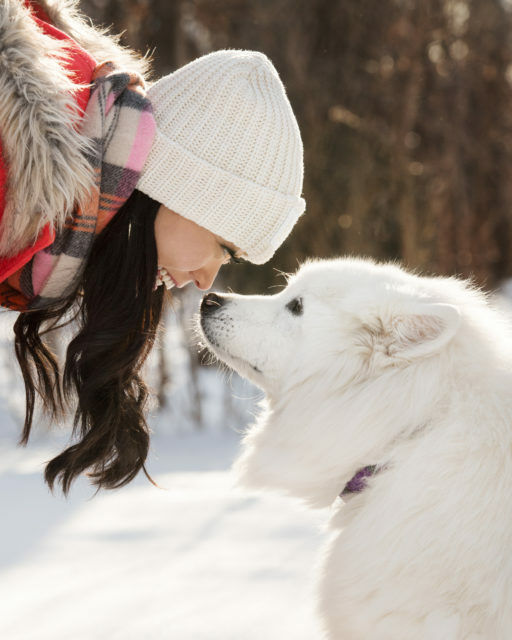 It gives pet parents one more happy memory with their loved one, and a little piece of their pet to hold on to after they’re gone. “Shortly before Christmas in 2009, I had a photo shoot with a woman named Joan. Her friend booked the session as a gift, and we had a beautiful sunny day for it. 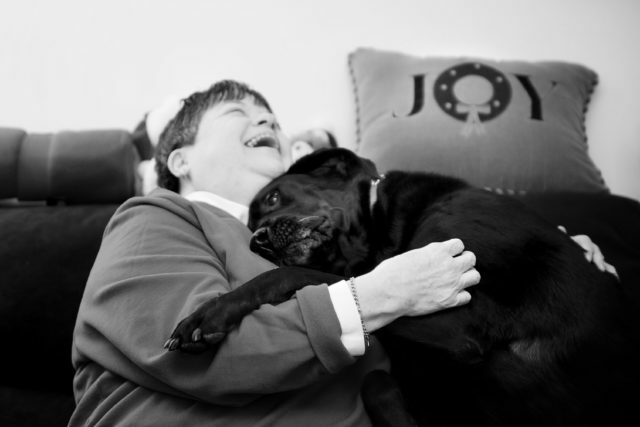 Joan was living at home in Hospice care, and relied on the companionship and day-to-day help of her Service Dog, a Black Lab named Joy. “Joy was her rock, her best friend, and had saved Joan’s life on more than one occasion. She would let Joan know when her blood sugar was low, and if she was about to have a seizure. Joy would place herself under Joan to break her fall, stand firm to help her up, and was by her side day and night. “I came into this session knowing that Joan didn’t have much time left, but I had no idea I’d be meeting such a vibrant, funny, happy woman. She was so blessed to have Joy come into her life, and her eyes lit up with every story she told of her. She said that Joy was her “gift from God,” and taking these photos had given her something wonderful to look forward to. “Their bond was palpable, and it was easy to see that both of them were very loved. Her apartment was filled with the word “Joy” in artwork and pillows and Christmas decorations. She even wore a “Joy” sweatshirt during our session. “We sat and chatted for a long time. Joan’s zest for life, even with her declining health, was a breath of fresh air for me, and helped me see that what I do is meaningful and important in so many ways. 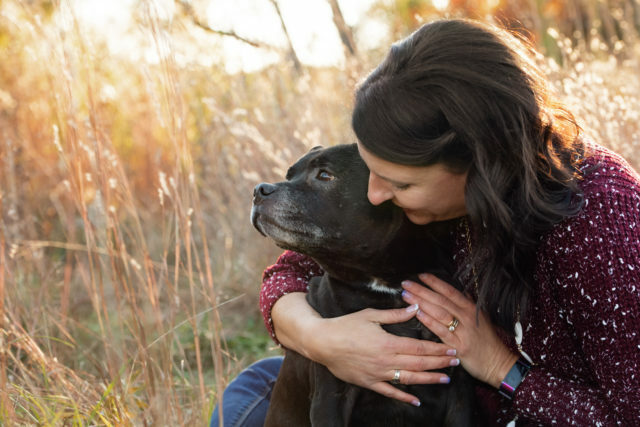 Without knowing it at the time, she and Joy sparked the idea to offer photo sessions specifically for pets that are nearing the end of their lives. For so many people, their pets mean the world to them, and I want to provide an opportunity to capture what makes them so special, especially in such a difficult time. “My first ‘official’ Joy Session® was with a Bernese Mountain dog named Griffin, in January of 2010. I really didn’t know what to call this service, and “Emergency Session” was the first thing I could think of. It sounded so cold and impersonal, and I struggled with what I should really call it. Since then Ernhart has photographed over 450 dogs and pet parents who are preparing to part ways. Most of her shoots are now Joy Sessions. The photos aren’t just about the dog — they capture perfectly the bond between human and pet, and somehow condense the years of love, trust, and loyalty into a single photo. Sarah Beth Ernhart was very generous in sharing some of her favorite photographs and the stories behind them with iHeartDogs. Max was adopted as an older dog, and quickly became his new owners’ “once in a lifetime” dog. He was discovered to have osteosarcoma and had to have one of his front legs amputated. I love the connection in this image: her hand on his head, the eye contact with the viewer. The fact that he’s laying down reflects his immobility at the session, but his expression and the warmth of the image shows he’s still as sweet as ever. I try to get a paw-in-the-hand image with every session, if possible. I think seeing pictures of yourself holding or touching your pets is a powerful trigger to remembering them – like you can almost physically feel them again, even though they’re gone. 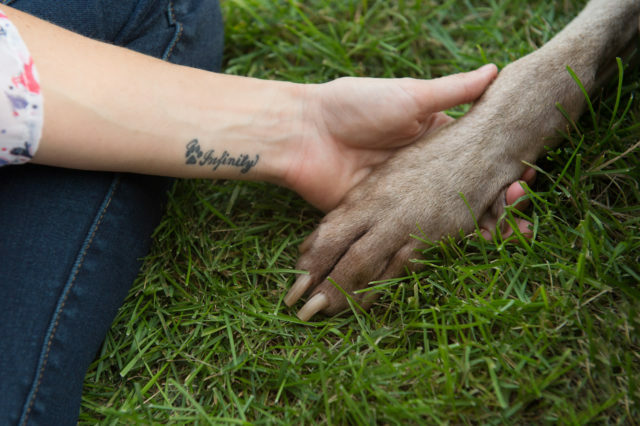 I love her infinity tattoo, and the gentle way she’s holding his paw. 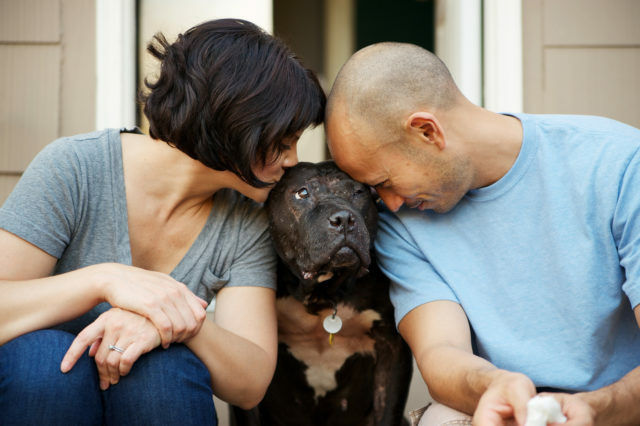 Bambino was used as a bait dog in a dog fighting ring, and these amazing people adopted him. He wears scars all over his face and body, but he’s perfect to them. I love the connection between all three of them. This is one of the happiest pictures of a dog I’ve ever taken. The look on her face, the smile on her owner’s face, the tight squeeze… everything about it makes me smile too. Franklin was a little skeptical of me during his whole session, and always kept an eye on what I was doing. I believe we had just been talking and laughing about that while he was peeking around her shoulder. This is the other happiest picture I’ve ever taken! I love everything about it: Mandy’s smile, her mom’s crinkled nose, the embrace. This was the second time I’d photographed Mandy, and this time her mom was pregnant. Mandy passed away before he could know her, but that little boy now looks through Mandy’s album every day. Mieszka really wasn’t feeling well for our session, but one of the things her mom really wanted was a touching-noses picture. It’s something they would do all the time, and she finally did it, just once, for this split second, and I was able to capture it. I love the perfect little space where they’re not quite touching, and that they’re looking into each other’s eyes. Rex was an older guy when his owner passed away, and he went to a foster home. It took a lot of work to get him to trust again, and eventually the foster fell in love and adopted him. Even though they’d only been together a year, she wanted to pay tribute to this big dog that won her heart, and knew she wanted a Joy Session to do it. I love how comfortable they are with each other, and especially how they both have their eyes closed. I photographed Tonka once before, back in 2010, and her owner wanted me to capture a Joy Session with her as well. I love when I get to see dogs more than once, because in this work, a lot of people only invest in portraits once per dog. It makes me feel like I’m part of their story, being invited in to capture both the prime of their life and the end. I love the colors in this image, and Tonka looking out in the distance. I met Zeus and his family back when I was photographing dog-friendly events, around 2009-2012 or so. They were regulars at “Beer With Your Buddy,” and when they contacted me because Zeus wasn’t doing well, I was so glad I could capture their family together one last time. I love the composition of this image, with the sunshine and how they’re both looking out in the distance. He’s so comfortable in her arms, and leaning into her, it’s just a really sweet moment. 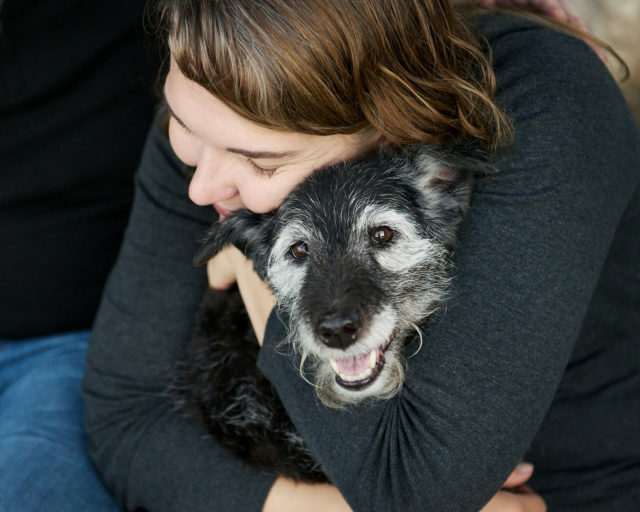 In 2012 Ernhart created a directory where those who are facing the upcoming loss of their pet can find a photographer who offers a similar service. 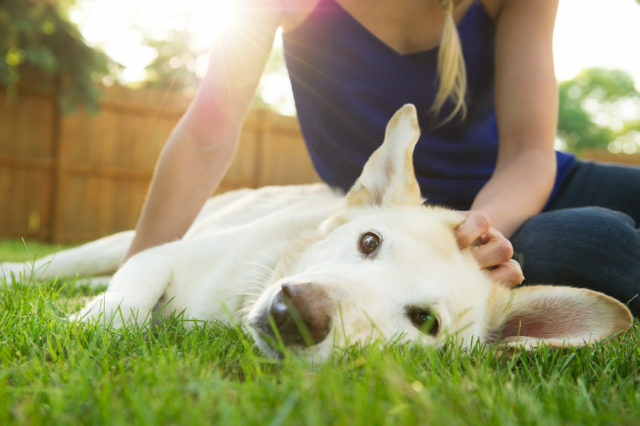 Thanks to her, it’s easier to find someone to help you turn the loss of your dog into a celebration of the life the two of you shared together. You can find Sarah Beth Ernhart online at SarahBethPhotography.com. Find a photographer to tell your family’s story at JoySessions.com.